King William wanted Lanfranc, the eminent abbot of Caen, to replace Stigand as archbishop of Canterbury. Lanfranc, however, was reluctant (it appears he doubted his own abilities – he had already turned down the archbishopric of Rouen), and asked for time to consider William’s offer. Ealdred, archbishop of York, had died in September 1069. On Whit-Sunday 1070 (23rd May), at Windsor, Thomas, a canon of Bayeux, was appointed to the position, but his consecration was deferred pending the installation of Stigand’s replacement at Canterbury. At the same time that Thomas was appointed archbishop of York, the bishopric of Winchester (which had been held, simultaneously with his archbishopric, by Stigand) was given to Walchelin, a chaplain of King William. Indeed, Orderic Vitalis (‘HE’ IV: ii, 200) says both Thomas and Walchelin were: “Normans, chaplains of the king”. Incidentally, Florence of Worcester is very clear that Stigand was deposed during “the octave of Easter”, at Winchester; that, at Windsor, Thomas and Walchelin were appointed “on the day of Pentecost”, i.e. on Whit-Sunday, and on the following day the papal legate Ermenfrid, bishop of Sion, at the king’s command, held a synod. Orderic, however, fuses these three separate events into one synod at Windsor, which, beyond saying it was in 1070, he does not date. Hugh Candidus tells how the Danes at Ely were so impressed by Prior Æthelwold’s “wisdom and understanding” that they promised him a bishopric if he would go to Denmark with them: “He pretended to them that he would gladly do so, and thereupon they gave into his keeping all their treasures, and delivered him the keys thereof.” Æthelwold hatched a plan to recover Peterborough’s most treasured relic, the right arm of St Oswald (“abiding entire and uncorrupted alike in its flesh and skin”), from its stolen feretory (i.e. portable shrine). Whilst the Danes were feasting, using tools which he had secretly acquired, Æthelwold managed (“with great labour”) to open the iron bound wooden chest which lay behind the shrine’s gold and silver cladding, to reveal “St Oswald’s arm, together with many other relics”. Æthelwold hid the relics in the straw of his bed. The next day, Hereward, because “his allies”, the Danes, were about to set-sail for home, freed the prior and the other Peterborough monks who were at Ely. Æthelwold employed “two faithful servants of his”, under the pretence of carrying something to Peterborough, to secretly convey the relics to safety at Ramsey Abbey. A group of prominent rebels, including Edgar Ætheling, had apparently been hiding-out in northern England waiting to see if the Danes would mount an effective campaign against the Normans. Now that it was clear the Danes were a damp squib, the rebels retired to Scotland. * Perhaps it was the same realization that persuaded Eadric the Wild to come to terms with the king. Lanfranc, reluctantly, and only after a direct order from Pope Alexander, agreed to accept the post of archbishop of Canterbury. He was appointed on 15th August 1070, and was consecrated on 29th August. Thomas, archbishop-elect of York, was subsequently, but not without argument, consecrated by Lanfranc: The Primacy Question. 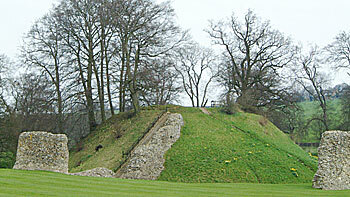 Berkhamsted Castle is a good example of motte-and-bailey construction – the picture below being taken from within the bailey looking towards the motte. It was originally built, with timber fortification, in the immediate post-invasion period. The earliest masonry probably dates from the mid-12th century. “At this time by the grace of God peace reigned over England; and a degree of security returned to it’s inhabitants now that the brigands had been driven off. English and Normans were living peacefully together in boroughs, towns and cities, and were intermarrying with each other. You could see many villages or town markets filled with displays of French wares and merchandise, and observe the English, who had previously seemed contemptible to the French in their native dress, completely transformed by foreign fashions. No one dared to pillage, but everyone cultivated his own fields in safety and lived contentedly with his neighbour. Unhappily this was not to last. Churches were built and restored; and in them pious men devoted their lives to rendering to God the prayers and praises due to him. The king’s passion for justice dominated the kingdom, encouraging others to follow his example. He struggled to learn some of the English language, so that he could understand the pleas of the conquered people without an interpreter, and benevolently pronounce fair judgements for each one as required. But advancing age prevented him from acquiring such learning, and the distraction of his many duties forced him to give his attention to other things. Symeon of Durham (‘Historia Regum’) names Siward Barn as one of the worthies who had previously retired to Scotland with Edgar Ætheling. Bishop Æthelwine, though intending to go to Cologne, had also ended up in Scotland at about the same time as Edgar’s party. * Æthelwine had been outlawed, and had (it is said) helped himself to some of Durham’s treasures on his departure. Æthelwine’s brother, Æthelric, had resigned as bishop of Durham in 1056, and Æthelwine had replaced him. They had both been monks at Peterborough, and Æthelric returned there after leaving Durham. Evidently at the same time that Æthelwine was outlawed, Æthelric “was accused” (agree Manuscripts D and E of the ‘Chronicle’, but ‘of what’ neither mentions), and arrested (he was taken, as a prisoner, to Westminster). This seems to have happened at the Winchester council ‘in the octave of Easter’ 1070 – Florence of Worcester notes that King William: “deprived of their honours certain persons, both bishops and abbots, whom neither the ecclesiastical councils nor the civil laws could convict of any open crime, and to the end of their lives held them in confinement, induced solely by mistrust, as we have said, of losing his newly acquired kingdom.” According to the story told by Symeon of Durham in his tract on the Church of Durham, however, Æthelric and Æthelwine were thieves. Symeon alleges (‘LDE’ III, 9) that Bishop Æthelric had stolen treasures from Durham and sent them to Peterborough. He subsequently resigned the bishopric and returned to Peterborough, employing the stolen funds: “in constructing through the fenny regions roads of stone and wood, and churches, and many other things.” It was of this thievery that he was, “during the reign of William”, accused and imprisoned. As for his brother, well according to Symeon (‘LDE’ III, 11): “When he had taken possession of the bishopric, Æthelwine contributed nothing to the stores of the church; nay his study rather was to abstract from it more of its ornaments and possessions than even his brother had done.” Symeon makes no mention that Æthelwine was outlawed, simply saying (‘LDE’ III, 17) he: “carried off a portion of the treasures of the church, and went on board ship, intending to leave England.” In the ‘Historia Regum’ (s.a. 1070), though, it is said that: “observing that the affairs of the English were everywhere in confusion, and dreading the heavy rule of a foreign nation, whose language and customs he [Æthelwine] knew not, he determined to resign his bishopric, and provide for himself wherever a stranger might.” There is no suggestion that he absconded with the church’s treasures. At any rate, when the captive Æthelric heard that Peterborough had been plundered, he, says Manuscript E: “excommunicated all the men who had done the evil.” Æthelric died at Westminster on the 15th of October 1072. According to Geffrei Gaimar, Æthelwine and Siward Barn had sailed from Scotland to the Humber, where they were met by Morcar. The trio met-up with Hereward and his outlaw band at Welle (the contiguous villages of Outwell and Upwell – some 14 miles north of Ely): “Then they harried much of the country which the Normans had taken. Thence they went to Ely. They did not fear their enemy.” (5475–5778). Roger of Wendover: “King William came upon them with the whole strength of his kingdom, laid siege to the fort both by land and water, and then, by cutting roads of great length and building very large bridges, he rendered the bogs passable to both men and beasts, and erected a new castle at a place called Wisbech”. .... As for the earl and the rest, who were scattered throughout England, he placed some in confinement, and permitted some to go free, having cut-off their hands or put-out their eyes.” What Happened to Hereward? The monks are said to have been unaware of William’s flying-visit to the monastery, which happened whilst they were at lunch. They caught-up with him at Witchford [a couple of miles from Ely, on the way to Aldreth], where they found out how much their complicity in rebellion was going to cost them: Paying the Price. The ‘octave of Easter’ is the eight-day period that starts with Easter Sunday and ends with the following Sunday. In 1070: 4th–11th April. See: The Apocalypse Approaches II. Letter 2, written between Easter (24th April) and October 1071, in ‘The Letters of Lanfranc Archbishop of Canterbury’, edited and translated by Helen Clover and Margaret Gibson (1979). In fact, Osbeorn had done a deal with King William, and the Danish fleet should have left the Humber at the end of winter. Clearly, it hadn’t. Housecarls (Old English huscarl, from Old Norse húskarl, literally ‘house-man’) were the household troops of the king or an earl. The Domesday Book, Lincolnshire section, shows Hereward to have been, pre-Conquest, a tenant of both Peterborough Abbey and Crowland Abbey. He had held an estate at Rippingale from Crowland. The terms of the agreement with the abbey were negotiated on an annual basis, but Domesday notes that: “the abbot took possession of it again before Hereward fled the country, because he had not kept the agreement.” Hereward had held land in Barholm Hundred from Peterborough, which he: “did not have ... on the day on which he fled.” According to a notoriously dubious, 14th century, source (known as ‘Pseudo-Ingulf’, a product of Crowland), Hereward was outlawed in 1062. These would have been small vessels which could navigate the fens between Ely and Peterborough. Manuscript D is one year in advance of the true date – the events of 1070 appearing s.a. 1071. Manuscript D is one year in advance of the true date – the events of 1071 appearing s.a. 1072. The word ‘their’ (heora) omitted in Manuscript E.
(See: What Happened to Hereward?). The ‘Liber Eliensis’ begins its Hereward story (II, 102) with a paraphrase of Florence of Worcester’s report of Earl Edwin’s death. Subsequently, however, Edwin reappears, alive and well. When Ely falls to King William, it is Edwin who is taken captive, whilst Morcar escapes. That Siward Barn was taken prisoner at Ely is only apparent because Florence of Worcester names him as one of those that King William “had delivered into custody in England or Normandy”, and who he ordered to be released, on his deathbed, in 1087. It seems likely, from later events, that Duncan, son of King Malcolm by his first wife, Ingibjorg, was one of the hostages handed-over to King William at this time. William, a monk of Jumièges Abbey, completed the ‘Gesta Normannorum Ducum’ (Deeds of the Dukes of the Normans) c.1070–1. He dedicated it to William the Conqueror, the 7th duke.